Junior Section Next Generation Needs You! The Junior Section accomplishes what it does through the help of more than a hundred volunteers from across all age groups. Many of the people helping direct the Section are parents of Juniors in our older age groups and whose children will be moving up and out of their junior hockey careers. Friday evening 19 January, Melinda and Gary were joined by Director of Junior Coaching Dan Fox and long time Junior helper Dave Dickson in the clubhouse bar for a short presentation to parents of Under 8s and 10s while the players were outside enjoying their training. We were thrilled to have so many parents listening and engaging. 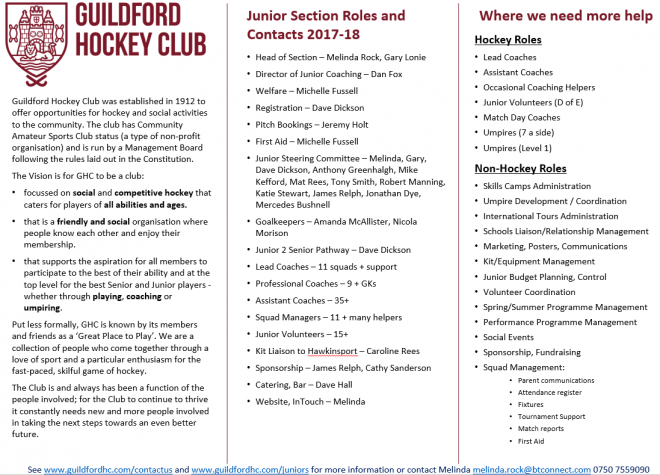 The message: GHC is a function of those who are involved running it - and we need parents of younger children to help make the Junior Section and Club what they want it to be. Over the past five years, we have grown the Section from 200 to over 600 juniors, with more teams competing and succeeding in County, South and National competitions than ever before. We have more players thriving in the EH Player Pathway than ever before, we have more and better goalkeepers than ever before, we have a strong programme of holiday camps and of course week in and week out we deliver great training and match experiences for hundreds of young players. There are hockey roles for which Dan is ready, willing and more than able to help support and lead. You don't need to have played hockey before - it helps for certain roles but if you have coached or are interested in or have experience working with children, please don't be shy. And there are plenty of non-hockey roles that help enormously and without which the hockey doesn't happen. Gary and Dave both talked about how much not only their children have thrived and made friends, but how much satisfaction they get out of helping and how many friends they have made along the way. Dave has helped in various roles since his daughter, now U17 was U11 - coach, squad manager, registrations, and now Board Member - his enthusiasm and experience grow every season. Gary has been involved for 12 seasons and mentioned how quickly the children grow up; soon enough they are finishing their A levels and heading off to uni - it's nice to have the friends and contacts made through helping at the club (for example if one is looking for someone to have a beer with!). Please see below our poster of what GHC Juniors is today. And also please have a look at some of the jobs and roles we need people to help with. There is no particular set formula - if you have an hour per week, or two hours during the season, it all helps. Many thanks to the people who came forward after the Friday night presentation - so great to have had a few people put up their hands! But we need more and more helpers to take over and move the Section and Club forward. Please get in touch or make yourself known to your child's coach or squad manager or anyone on the list below. It is really rewarding to see how much the young players thrive through our efforts.